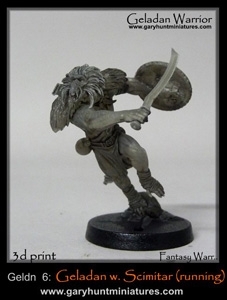 This is for one 28mm to 32mm Geladan with Scimitar (Running) made ina pewter metal. Useally ship within 5 to 10 Business Days. well for the month of November any order over $60.00 well be going in a draw for a prize. this prize is valued at $25.00 prize will be adviced in the up coming days. Gin Gin Games & Hobbies is now taking Advance orders on all the listed ChapterHouse Studio Products. Gin Gin Games & Hobbies is now offering 3 month laybys see the Terms and Conditions page for more details.